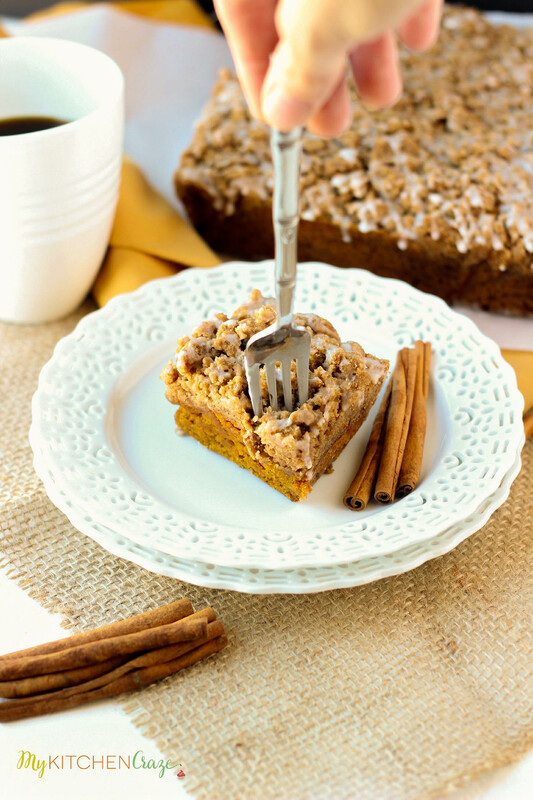 Grab a fork folks because you wont’t be able to resist this Pumpkin Coffee Cake. Delicious and moist! 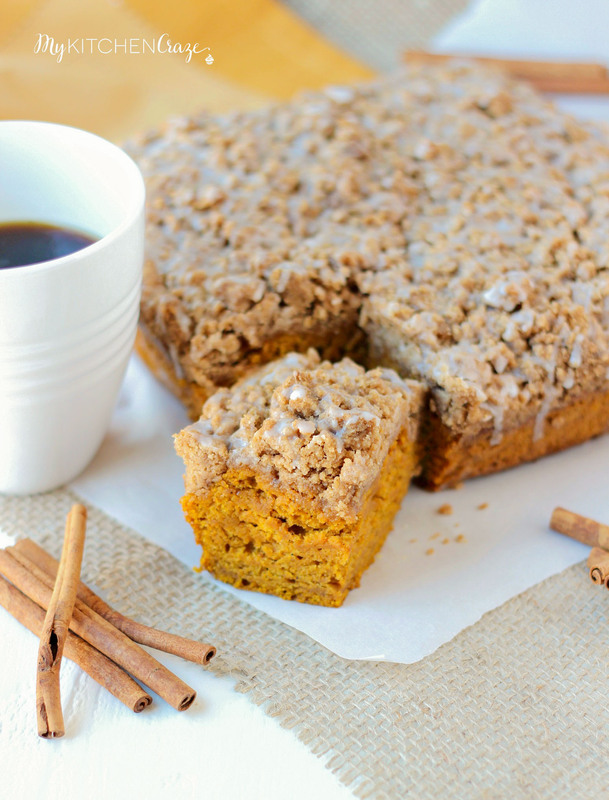 This crumbly coffee cake is going to get you in the Fall spirit. Topped with big chunks of crumbs and a simple glaze, this cake will have you running back for another slice. *Updated: I updated the photos and recipe for this post. This is such a delicious cake that I needed to re-make it and update the photos for you all! Fall is in full swing at my house. The temperature might not be, but I’m jumping ahead and going all fall-y on everyone. Man oh man, I love pumpkin. Everything pumpkin from cookies, bars, pancakes, waffles and even my coffee. I think I exhaust my family with pumpkin. By the time Thanksgiving is over, they’re begging me to stop cooking and baking with pumpkin. I do feel bad because I kinda of go over board, but that’s what the seasons all about. How fun is it to enjoy a new dessert and some cooler weather? And let me tell you that I do enjoy the cooler weather. 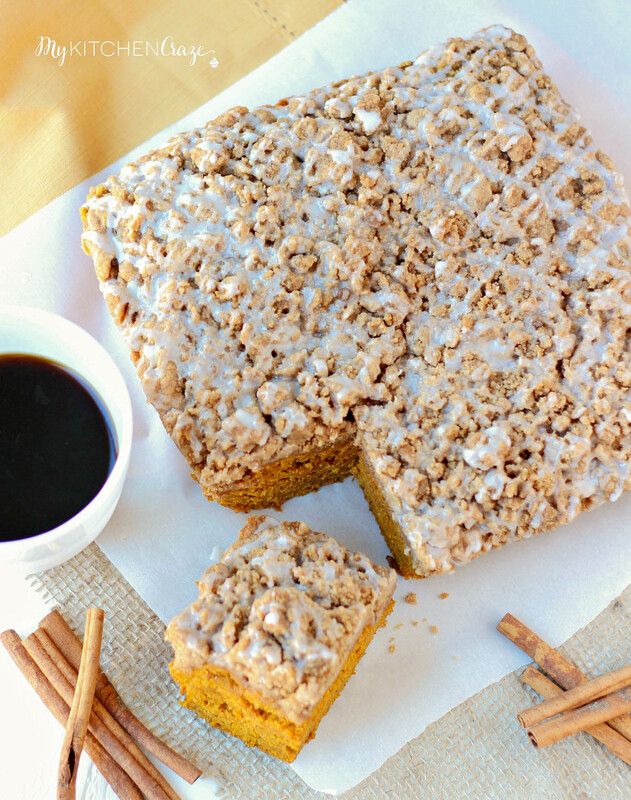 I love to snuggle up on the couch with my coffee and a nice piece of pumpkin dessert. There’s nothing like a homemade pumpkin dessert! I love when fall season is here because not only is it pumpkin season, but it’s cooler weather time. I can take out my sweaters and Uggs because I know that we’re going to get some double digits soon. Good bye triple digits. We will see you in 7 months and not anytime sooner, please. 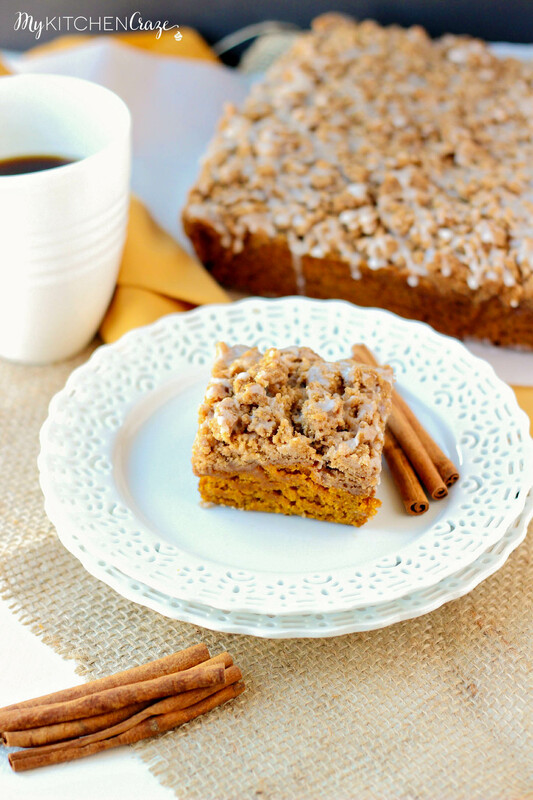 This little coffee cake is a cinch to throw together and tastes oh so good. I recommend the next time you’re at the grocery store you should buy a few things for fall season. You’ll need pumpkin puree cans and I would stock up. Be crazy like me and buy 5-6 cans. I use the Libby 100% pure pumpkin and never have any issues. Pumpkin Pie Spice seasoning. You’ll use it in all sorts of recipes. 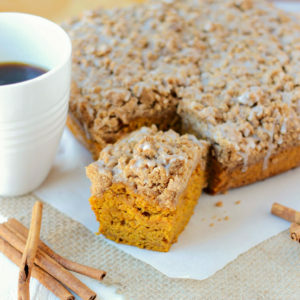 You could substitute out the nutmeg, cloves and just add 1 teaspoon of the pumpkin pie spice. You should also get these spices: cloves, cinnamon, ginger and nutmeg. Those are just a few spices you’ll use every once in a while during the fall season. I have another recipe coming up in a few days that uses all 4. 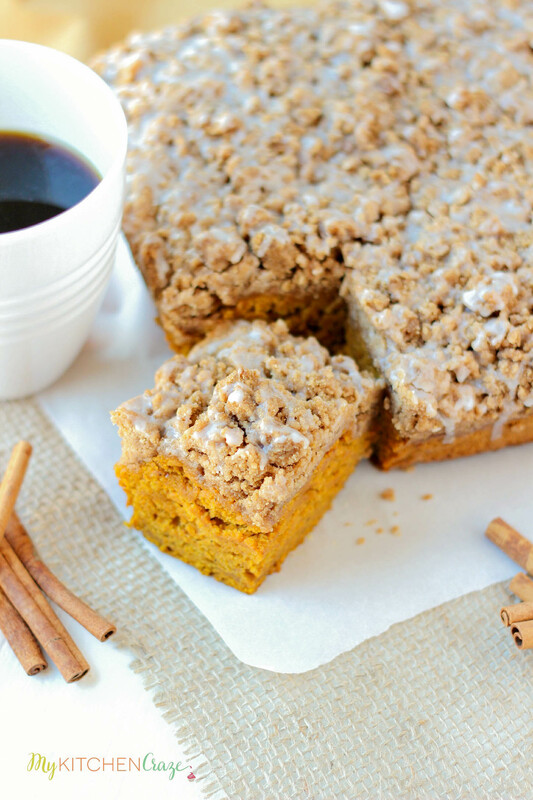 This Pumpkin Coffee Cake is amazingly moist, soft, and one of the best coffee cakes I’ve ever made. If you need something for a dinner party or maybe a potluck, this coffee cake should be it. I’ll be posting more pumpkin recipes as the weeks go on, but I urge you to give this one a try. Happy Fall Season everyone! Enjoy your cooler weather and pumpkin recipes. Preheat oven to 350 degrees F. Line a 9x9 baking pan with foil and spray with non-stick cooking spray;set aside. Make the cake by whisking the flour, baking soda, baking powder, salt, cinnamon, nutmeg and cloves in a large bowl until combined. In a medium bowl mix together the pumpkin puree, brown sugar, oil, maple syrup, and milk/buttermilk until combined. Pour the wet ingredients into the dry ingredients bowl and stir until just combined. Do not over mix! Pour/spoon the batter into the prepared baking pan. Spread the batter to make an even surface then add the crumb topping. Make the crumb topping by adding flour, brown sugar, salt and cinnamon in a medium side bowl; mix together. Cut in the cold butter using a pastry blender or a fork (sometimes your hands work best). Mix in cold butter to create crumbs and clumps. Grab some of the crumb topping and make a big ball. Then gently crumble the topping into batter. Do this until all the crumb topping in on top of the batter. Bake cake for 30-40 minutes . Check doneness by inserting a toothpick into the center of the cake. The toothpick should come out clean with some moist crumbs. Let cake cool complete before adding the glaze. Once the cake has cooled completely (roughly 30-45 minutes). Whisk the confectioners sugar, 1-2 tablespoon milk together until smooth. Sprinkle in cinnamon and mix. Drizzle glaze over cake. Cut into squares and enjoy! Recipe slightly adapted by: Sally's Baking Addiction: I added more flour and butter to the crumb topping and also took out the salt. I also added a little cinnamon to the glaze.